We thank you in advance for giving this Sponsor opportunity serious consideration and we hope you will decide to be a part of these exciting festivities and allow us to promote your business in the South Bay community. From Friday, September 7th through Sunday, September 9th, the Lomita Fair will celebrate 36 years of providing a safe, family-friendly and entertaining community event for the whole family. The Lomita Fair is one of the most well attended and longest running events in Los Angeles County attracting over 50,000 people from neighboring cities over a three-day period. In addition to providing an opportunity for the community to come together, the Fair is also a major fundraising event for St. Margaret Mary and the proﬁts are used directly by the church for community services as well as to help meet the budgetary needs of St. Margaret Mary elementary school (K-8). We’d like to invite you to be a sponsor of this popular event. 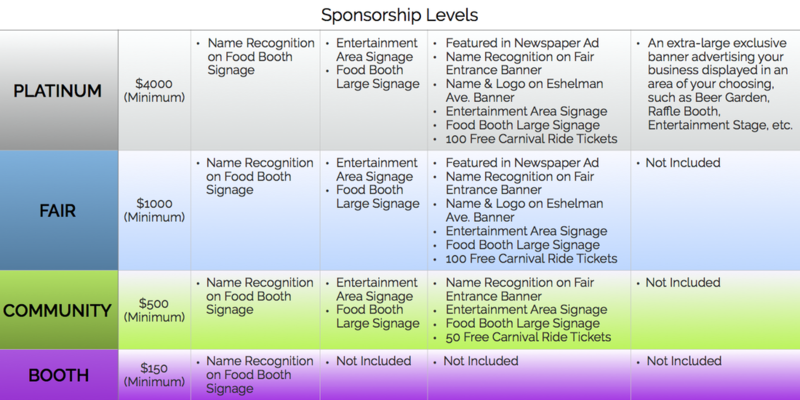 As a Sponsor, you will have advertising beneﬁts, plus receive recognition and entitlement for the duration of the fair. Your business’ sponsorship can provide you with signiﬁcant exposure and help you reach many potential patrons while supporting this worthy fundraising effort. You will also have the opportunity to be included under sponsors on the Lomita Fair website, www.lomitafair.net. We offer our ‘Platinum’, ‘Fair’ and ‘Community’ Sponsors the additional benefit of including a link to your website on our Sponsor page for recognition and additional sales exposure. Are you interested in sponsoring the beer garden, rafﬂe booth, entertainment stage, and/or the attendance raffles? Then become a Platinum Sponsor; by donating $4,000 or more, you will have your brand/business name exclusively located in the location of your choice (see below). tax-deductible donations no later than August 15, 2018. ​St Margaret Mary Lomita Fair is a 501C Non-Profit Organization All donations are tax deductible.